Q: What are you doing to make life easier for the soldier? A: Usually, military people do not like connectors and cables that penalize movements and are not easy to handle, especially by night and in extreme conditions. But with the evolution of soldier technologies, involving more and more electronics, they are a necessary pain. We, at Fischer Connectors, develop connectors that make life of soldiers easier in the field by improving lightness, miniaturization, ruggedness and ease of use. In the military field a range of specific MIL connectors have been used for many years as for example the MIL 38999 connectors, and many others with bulky screwing and bayonet locking systems. More than 55 years ago, Fischer Connectors developed a special locking mechanism named “Push-Pull” which has a growing presence in military markets. This system has quite a lot of advantages, especially in the ease of use, safety of mating, and the fastness in connection and disconnection. Compared to MIL connectors our push-pull system allows reducing the size of the connectors while still keeping a high number of contacts. Today we can fit 27 contacts in a 15mm Ø connector. We also provide connectors with emergency release systems, which are typically used for pilot helmets, head sets and weapon optronic sights; this to avoid damages to the material and injuries to the users. Q: How do OEM’s engage with the military? A: As we manufacture connectors, which are components and not a direct usable device, we indeed rarely have a direct contact with the army or large organizations like NATO. We are mostly contacted by key players who supply worldwide military forces with electronic equipments such as computers, communications systems, surveillance, and target acquisition devices. Then with the feedback these companies get from the field, we closely collaborate to improve the characteristics of our products, if necessary. 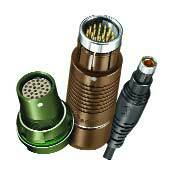 Once an equipment is approved by military forces, our product becomes a standard for this application. Q: What are the key developments in defense and security markets and how are you responding to them in your product line? A: Global requirement of military forces concerning connectors are focused on more rugged solutions, always lighter, smaller and able to transfer an important dataflow. Here is a paradox; smaller & lighter connectors may be perceived as more fragile.The challenge is therefore to offer the best compromise in ruggedness, space and lightness. One way is to use lighter material as we did with our new AluLite connector range, made of special resistant aluminum alloy. The other way is to increase the contact density in order to minimize the number of connectors needed. The demand for transferring high definition pictures, as well as HD video from the battle field, will push the design of connectors to hybrid solutions that will include fiber optic, signal and power. The biggest challenge will be to ruggedize the fiber that is very sensitive to shock and dirt for an intensive use in the field. Based on our experiences in other markets, we are working on innovative solutions for defense & security applications. Q: What are the specific challenges for Soldier Modernization Programmes? 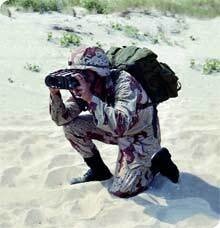 A: Future soldiers are intensive users of high end technology in terms of observation, identification, orientation, target acquisition, communication for voice data and video. This represents a lot of different electronic equipments that have to communicate between each other and exchange information with other troops and commanders. Important decisions are taken based on this information, so if incompletely or not transmitted, it could have dramatic consequences. For this reason, we give a particular attention to the quality, reliability, and ruggedness of our products, which are an essential link in the transmission chain. In addition, all these devices require a lot of electrical connections, making the weight of connectors become a non negligible element of the soldier’s load. Reason why we recently developed a complete line of lightweight connectors, called AluLite. These aluminum case connectors available in various colors including military green, sand or black are made of an aluminum alloy used for outside construction and marine equipment. This material enables our AluLite connectors line to be very resistant to shocks and corrosion, offering the same performances as standard connectors at only half the weight. This could represent 200 grams per equipment that can be used for additional water or ammunition. Increasing the density of contacts in a connector is also a way to save weight, number of cables and manipulations. What was done by two connectors yesterday could be done by one today with the same size. Ergonomics is important too. We adapt our connectors with specific cable output or we offer overmoulded solutions in order to minimize the impact of connectors on soldier’s movements and sensations. When you crawl in the field, the connectors must not cause discomfort. Q: Which programmes are you working with? A: We are involved in most of US, European, and Asian soldier modernization programs through the main contractors supplying equipments for C4ISTAR capabilities. Q: In what type of applications are your connectors most used? A: We mainly supply our connectors for personal radios, rugged computers, optronics systems, GPS, night vision systems, portable satellite communication and UAVs. Another important sector for us is training and simulation. his, because those systems use an important number of detectors, sensors and lasers emitters that require a lot of electronics which have to be linked together. In this domain we collaborate successfully with the key players in this market segment. Q: What are your criteria for success in the defense and security market? A: Our success in the defense market is mainly due to the transition from centralized use of large electronic equipment to the use of much smaller equipment by each soldier. Our push-pull construction fully responds to the need of small connector size with high contact density. Furthermore, our products are perfectly adapted to be frequently manipulated up to thousands of mating cycles and they are designed to work in harsh environments at extreme temperatures (-55°C to +135°C) with high sealing performances (IP68; -2m/24h). These characteristics perfectly match military requirements. An additional factor is the ease and speed of handling with regards to connection and disconnection, especially when using gloves. Mobility and reactivity in the battlefield are key parameters in the success of your mission. If you have to set up a transmission, observation or weapons systems and if you can save 10 seconds per connection, the cumulated saving represents precious minutes that could make the difference between life and death. Your life not only depends on rapid connections but also on an accurate transmission of signals. Once you press a button, you must be 100% sure your decision becomes an action. Therefore you must be able to blindly rely on the performance of your connector. Our products are all manufactured under the strictest quality conditions and current industry norms. Q: Are particular connector designs optimized for one environment over the other? A: Our connectors are engineered to be functional in extreme environments and all theaters of operations: from high mountain peaks down to under the sea and from desert to swamps. For effective camouflage, we offer connector colors that match the shade of the equipment, such as military green, sand or black. Finally, for very specific needs and if none of our 10,000 standard products fits, we are always ready to offer customized solutions. Q: Why come to the stand at Soldier Technology US?